It’s Wallpaper Week! So what better way to celebrate than by chatting to wallpaper gurus Graham & Brown. 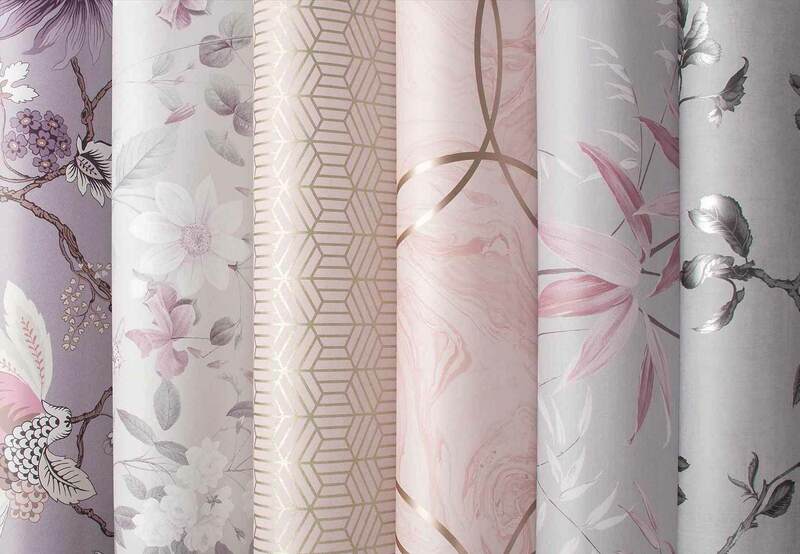 If you’ve not heard of them, these guys are the UK’s go-to for all wallpaper needs and it’s no surprise really when they’re doing collabs with big names in the industry like Kelly Hoppen and 2LG. To celebrate wallpaper week we want to share with you what’s hot in the wallpaper world, what trends we foresee for the future of wallpaper and our top tips for a smooth application process. Oh and we might even tell you lot how to easily visualise it at home before buying. We predict for 2019 that people will be conscious about making positive changes in the home to promote a better wellbeing through their interiors. Thus, patterns with soft curves, calming colours and botanical images (i.e. elements which all promote wellbeing in the home) are the types of designs we expect to become popular through to next year. Try something like Botanical Black or Sound Wave Wallpaper. Heard of chinoiserie? It’s a Chinese inspired decorative style originating from the 18th century that’s making a comeback in the industry this year. It lends itself to be the perfect pattern for a wallpaper design with it’s beautiful hand-painted style and intricate designs. It comes as no surprise therefore that Graham & Brown have chosen a design named ‘Tori’, a chinoiserie styled pattern, as their wallpaper of the year for 2019. Available in colours like blush pink, pastel yellow and grey for those neutral lovers, it’s set to be a popular choice heading into 2019. Botanical Shadow, £50 per roll / Imperial Orange, £50 per roll / Black & White Dots, £50 per roll / Aqeous Geo Quartz, £40 per roll / Black & White Geo, £40 per roll / Tori Teal, £50 per roll. Yes wallpaper is a great affordable alternative to paint. To calculate how much you need, workout the height and width of the area you need to fill and enter these details on the ‘how many rolls’ button on the G&B website. E.g. a wall with a ceiling height of 2.5m and width of 4m works out at just two rolls costing £80. If budgets are tight, try starting with a feature wall. You can always add more on the remaining walls in the future. 1. Grab all the necessary tools prior to starting. This will include things like a wallpaper brush to smooth bubbles, a seam roller, a spirit level, a tape measure, scissors, water, a wet sponge, and a utility knife. 2. After you’ve cut the wallpaper into strips, lay them on the floor and ensure you’re going to be able to line them up properly so the pattern repeat is seamless. 3. Buy extra wallpaper to account for any potential hiccups in the application process, especially if you’ve got something with a pattern on it. 4. If you’re applying wallpaper over a dark wall, paint a one inch strip of white paint along the bottom and top of the wall. This way it won’t be as noticeable if your wallpaper fails to align exactly at the top or bottom of the wall. For a more detailed ‘how to’ with tips and tricks, head to Graham & Brown’s FAQ section. Find it hard to visualise what something will look like on your home? Fed up with the Dulux visualiser app? Enter, the new tech award finalist app created by Graham & Brown to help you cut and paste wallpaper samples onto pictures of your home. Pretty nifty, eh? If you fancy taking a look at how it works, click here.